Preparations have begun for one of my favorite times of year at Walt Disney World. 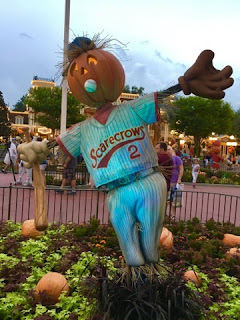 The Magic Kingdom is decorated, and ready for the season's first "Mickey's Not So Scary Halloween Party" tomorrow night. I took this shot of the baseball playing scarecrow tonight in Town Square.